The Zeno Explorer ETA, the ZEX as it is known in the WIS community, is considered by many on TZ-UK to be one of the watches to have alongside others, given its style and price level. For quite a few it supposedly is a typical 'quality beater'. And they are probably right. I ordered this one on Friday, 31 August, from Eddie. At the end of the day, so he would ship it on Monday morning. It arrived on Tuesday, my birthday. So out with the Laguiole knife and into attack mode to slash the UPS bag and then a fair amount of armoured tape before I could open the box. Y'all know the Platts/Timefactors drill by know... ;-). Out came the little Zeno-Watch Basel travel case, not a zippered pouch one but a rounded box-like case, containing the watch, its Zeno guarantee card plus Eddie's business card and a polishing cloth. The cardboard box also contained the usual Timefactors envelope with instruction sheet and invoice. I tried on the watch, and found that I could size the bracelet fairly well without removing a link. However, I am not into polished bracelets. It makes the watch look too bling and thus, paradoxically, cheaper. So off came the bracelet, and on went a brand new 20 mm wide RAF 2-ring Bond NATO. I am not the first one here to note that this is the ultimate strap for the ZEX. Just for the heck of it, the next morning I swapped straps again and put in on a green NATO to go with my kaki green workpants. It looks quite good on green, actually; even my Significant Other thinks so. I have also tried it on a black leather one-piece strap with a wrist-cuff style backing pad, similar to a Bund, and it looks great on that, too. 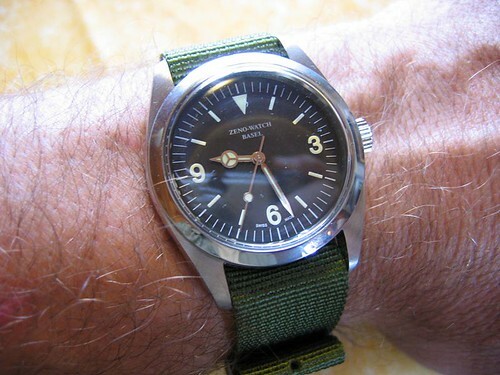 It simply looks good on any NATO-style strap. On day 3 I put it on a tan leather NATO, which is not bad either. Like I said above, anything but the bracelet, but that of course is a matter of taste. The ZEX is a no-nonsense steel watch. Large, thick lugs, acrylic crystal. The crown is precise when setting, with virtually no play in the hands. Handwinding feels a bit 'dry', but it works. Given its moderate waterresistance rating it could have had just a non-screwed crown (with a double seal), which would have avoided the typical problem of a worn thread on the crown tube. When one sets or winds the watch, it takes a bit of patience to 'find' the crown thread while pressing in the crown against the spring action of the coupling/decoupling mechanism. Once it bites, it screws snugly against the case in about two full turns. This example is consistently slow: it loses just over half a minute per day, which is nothing to worry about but will need to be corrected by a watchmaker some day. It is very consistent, no matter its position or my activities, so it is quite precise even if it could be a bit more accurate. The only real reason to have it regulated is to minimize wear on the crown thread (see above). With a non-screwed crown I would not mind at all synchronizing it every other day or so. Of course as a matter of principle, it would be better if an automatic with a screwed crown would be at least modestly regulated to be a little fast, say 10-15 sec/day, so setting could be reduced to once a week (being half a minute ahead won't make you miss appointments) and done by hacking it. The ETA movement is precise enough to allow that without a lot of trouble. Maybe Zeno wanted to cut costs a bit by not letting its watchmakers spend time regulating, and thus lifted the 'super precision' print from the dial? Mine is the newest model which just says 'Zeno Watch Basel' in the upper half of the dial in small type and light grey printing, and nothing else. When all hands are in the upper quadrant, the empty dial is a bit of a black hole at first - but it has really grown on me. More text just would serve to enhance a 'fake Rolex' effect, as Rolexes tend to splash their 'superlative chronometer/officially certified' marketing blurb on the dial. Little or no text: no mistake, this one may look similar, but it is not a Rolex and not pretending to be one either. The Explorer-style dial is very legible and utilitarian. Lume could have been a bit better, especially on the hands. The large ball on the hour hand is just recognizable in the dark after five or six hours, so you get a rough idea of the time, but the minute hand is almost impossible to see. As soon as dawn arrives, the gleaming metal of the hands will allow you to see them clearly in a semi-dark room though. I love the case shape and the fact that it has 20 mm lugs instead of the 18 mm that is the usual size for this case diameter. The springbars leave generous space to pass through a thick one-piece or military style strap; it is the only watch in my modest collection that accepts a Rhino with room to spare. With its 45 mm lug to lug the ZEX wears perfectly well on my 18 cm/7.25 inch wrist. I never understand how people can wear watches with a case size of 45 mm or more, to which a fair amount of lug length must be added. These must snag in everything and bang into every door, unless you are Hulk Hogan. 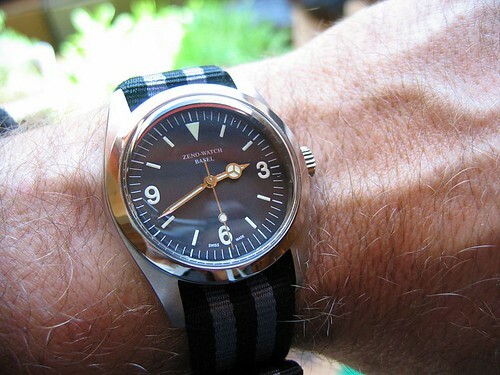 Generally, this is a very nice watch for anyone wanting that vintage Explorer look in an affordable watch that is not an outright copy but an honest homage. As said, it might have been technically better with a twin-sealed non-screwed scrown to allow frequent setting without wear, but that is a matter of personal opinion. After two weeks the ZEX has grown on me, and I think it will continue to get a lot of wrist time. Congratulations on making it through the Timefactors packaging :D and thank you for a nice review. You'd better get one quick then, it's been discontinued by Zeno and I have 4 in stock. Zeno doesn't have any. I also have 4 with the Miyota movement. There are no more with text above the 6. I've had 3 of these at various points, they're just a nice, honest little watch. Very solid and reliable. Good review, by the way! Thank you for the excellent review. This watch has been on my list for a while but I'm saving my pennies for the SB3. With it being discontinued though maybe I need to rethink my spending priorities. Eddie - you've acknowledged in the past that you thought the ZEX was a good Explorer hommage, implying that your own hommage might not have much of a market. With Zeno discontinuing this model, would you consider coming out with your own interpretation? However it just looks soooo good on the nato's. I hope you're happy Frank. Because of your review I just placed an order with Eddie for the ZEX. I actually already knew I wanted one but had a couple other watches higher on the priority list. The fact that Eddie mentioned it's being discontinued and he has 4 of the Miyota models hanging around spurred me into action sooner than I had planned (I ordered the Miyota). The price seems just too good (even with the current exchange rate) to pass up. Wish I could agree with the mercedes hands but alas, they are not for me :( If only... @£80 it must be a hell of bargain! Just out of curiosity, what kind of accuracy should one expect from the Miyota movement? I wish I could tell you that. I never owned one. Maybe one of the other ZEX owners around here can comment on that. In any case, precision (as in consistency) is more important than accuracy right out of the box. A precise movement can be regulated to good accuracy and will then maintain that. I have a Citizen Blue Eagle with a Miyota 8200 or 8000 movement, accuracy (which I'm not overhassled about) is ok, as far as I can tell - maybe about 10 slow a day, which is in the same league as the watches I've had with ETA autos (Sinn 656 is -8 a day, Speedbird was +15, DJR Highlands about -15, I think). All in all nothing to gripe about - and a crude hack (is that an oxymoron?) can be obtained by backwinding the crown when setting. This is helped with the Miyota movements, as compared to Seiko 7S36 etc by the fact that they can be wound, so you don't have to shake-backwind-shake when starting it up. I've just picked up the ETA movt version from the Sales Corner, and this review has whetted my appetite - thanks a lot! It's now a few months after I purchased the Zex (7/12/2007). It has grown on me even more than I expected. I have modest collection of watches: PRS-4, PRS-6, PRS-10, an pretty battered Wenger Pilot Titanium, my oldest Edox Delfin, a Sinn 256 with a problematic crown, and the Zex. The latter gets more wrist time than all the others put together. The PRS-4 (also reviewed in this section) is a good second as it's my ballooning watch. The PRS-6 has been relegated to dress watch after Zeno put in a new mainspring, and the '10' gets worn for dirty or rough work (DIY, wood chopping etc.) - that is if I remember to take off the Zex, which I frequently forget simply because it sits on my wrist without being obtrusive. Thus I end up wearing it frequently as a beater, out of forgetfulness rather than deliberately. And it just stands up to it. As I wrote in the original review, the only gripe, if you can call it that, is the accuracy combined with the screw-down crown. It stabilized at about 40-45 seconds per day slow, which is no problem in a rural setting where life is not counted by the second anyway. But I'm always wary of setting it and unscrewing/screwing the crown (I have read other reviews that mentioned the thread wearing out rather quickly), and tend so set it about 2 minutes fast so I can limit synchronisations to once every three days or so. Zeno told me that I can have a good local watchmaker regulate it without voiding the warranty, which is nice of them (whether it's more efficient to drive over an hour to the only decent watchmaker in these lands and drive there again weeks later to pick up the regulated watch, while Zeno can do it by mail in two to three weeks, remains to be seen...). We'll see. I am of a mind to just continue for a while to see if the crown wears down within the warranty period. Good test, that. Before I got this watch I was, like a fair number of people, not very enthusiastic about mercedes hands, but I have gotten used to it. And the almost total lack of text makes for a very clear, uncluttered dial. Sure, I would not have minded 'automatic' or something like that in the lower part, but not having that does not bother me in the least. Apparently, the first Rolex 1016 sold for 165 dollars or thereabouts in the late 1960s. Not cheap at the time, but obtainable for anyone willing to save up a bit. For that money thay got a no-nonsense, properly engineered all-steel beater watch. Today a modern Explorer with its white gold indices and hands, and sapphire crystal, is no longer a steel beater for guys doing manly things (even if it's not climbing Everest). The Zex is just that. No pretense. There is a lot of discussion going on about Eddie possibly doing a TF/Precista version, as the Zex has now been taken out of production by Zeno. Which would be a good idea, there certainly is a market for this watch, or something very like it: not larger, no sapphire, just no-nonsense. See the section on TF Watches. They have shot up in price . Poor VFM in my opinion. The manufacturer seems to have real QA issues these days and some need sorting out by a good watchmaker to ensure smooth running and good timekeeping. The new Everest is a much safer bet and has a much nicer dial design in my opinion.